Rory is a self taught knifemaker who honed his skills at the US workshop of master craftsman Bob Loveless. Rory has been working in West Cork for the past twenty five years, and is one of the most respected professional cutlers in Ireland. Rory has received numerous awards and much publicity for his work. Rory designs and makes a wide range of knives including kitchen knives, table cutlery, carving sets and cheese knives. He also designs and makes a range of knives for outdoor pursuits such as hunting, fishing, sailing and camping and specialised knives for gardening and various crafts. Rory also works closely with clients who wish to commission a one-off knife. Rory works in stainless steel and carbon steel for the blades. Damas steel is used for a patterned finish. Handle materials include bog oak, ethically sourced exotic hardwoods, staghorn and coloured wood laminates. The result of Rory’s unique talent is a truly beautiful work of art which is also to be used and enjoyed for a lifetime. My Dad gave me one of your field knives, the Irish pattern Bowie as a gift years ago. I have really enjoyed it but haven’t used it much. 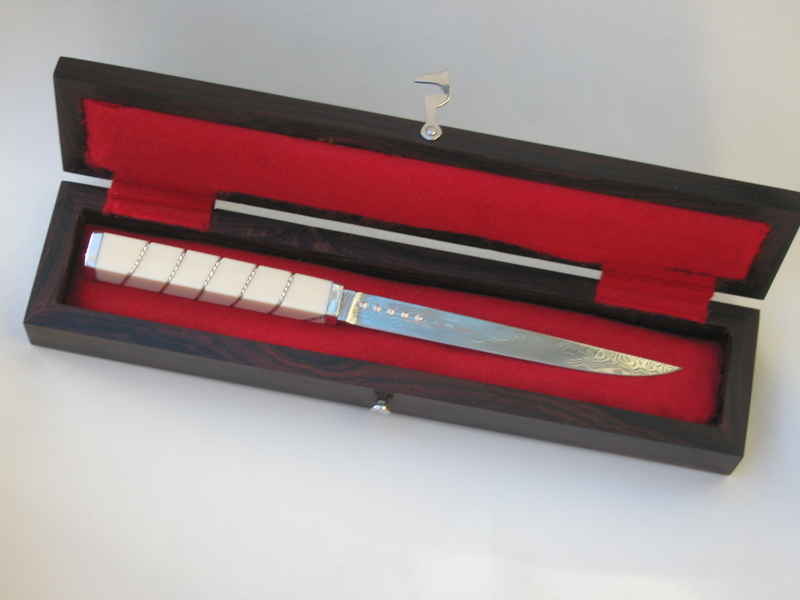 I will soon be spending more time in the outdoors where I may find more enjoyment in using it, and was was wandering what the knife is ideally suited for and what it is made out of – I will be near salt water sometimes. Finally it’s been a lovely knife to have around in the house – thank you! I have been using your bowie knife for over 10 years now. I was a clasic bowie knife, back then i was for sure the only one of those in Poland. I had a lot of othere knives including falkniven and cold steel knives that are commercialy consiedered as good knives. I have to say that your bowie is the best i have ever seen. Dear Rory, thank you so much for allowing us to visit you in your workshop, for your fantastic talk on your amazing work and for all your valuable time. Just received another great knife from Rory. Numbers 1015atst and 1138atsf. Craft work at its best.